His big game against Arizona’s 7-footers was a breakthrough for Noah Dickerson, who was ready to transfer after Lorenzo Romar was fired. Guess who talked him into staying? The Malones, Karl and Moses, salute you, elbows up. What made Saturday more remarkable was Arizona deployed two good seven-footers, senior Dusan Ristic of Serbia and freshman Deandre Ayton of the Bahamas, to wall off the inside. Ayton particularly was formidable, an agile athlete with a quick leap who is expected to be a top-three pick in the NBA draft in June. He’s the Pac-12 Conference’s second-leading scorer and top rebounder. “I’m kinda challenged, height-wise,” he said. “So I use my pump fakes, my footwork . . . I put my body into them so they can’t jump. I have really long arms and it’s hard for them to go get it. It was a big thing I was working on. As spectacular as was Dominic Green’s buzzer-beating, game-winning shot, what drove the Huskies’ most significant home win in years was Dickerson’s game-long ability to find his way through the forest, and also avoid fouling out (one personal) defending giants. Dickerson’s 15-point scoring average is 13th in the conference. His 8.1 average on the boards is fourth. 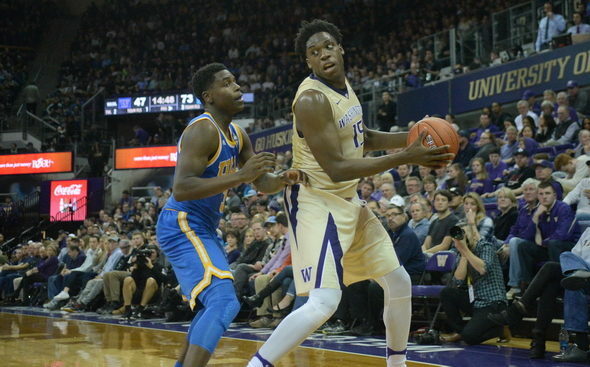 Safe to say that without his inside game, the Huskies’ season would have been on the outside of the race — its usual and accustomed place in the final years of the Lorenzo Romar era. Although Mike Hopkins has rightly been hailed for the one-season renaissance, the Huskies coach deferred credit regarding Dickerson’s unusual ability to get his shot off inside. “He has a God-given ability to score in the post,” he said, apparently reading from the Book of First Alcindorians. “You can’t really explain it. He’s got great footwork — kind of uncanny, I don’t want to say he’s awkward — but he’s got good moves and a good touch. Dickerson may not be great quite yet, but the junior has started all three years and has improved steadily. A native of Atlanta who finished his prep career at Montverde Academy near Orlando, his world was rocked 11 months ago when Romar, the man who brought Dickerson out of Southeastern Conference country to far-off Seattle, was fired. He seriously considered transferring. Dickerson took a visit to Louisiana State and was about to visit the University of Florida when he was double-teamed by Romar and Hopkins. The new coach gave the old coach credit for lobbying players to stick around. In April, Dickerson announced his decision on Twitter. Assist: Romar. Friday before the game, Dickerson caught up with Romar, returning to Montlake for the first time since he was fired. So too were Huskies fans. Saturday was such a dramatic, well-played encounter that the audio reached levels unknown to players mired in three years of doldrums. Hopkins, who tends toward the hyperbolic, was ecstatic about the atmosphere and the advantage it offers. “Our crowd was one of the main factors in us winning,” said Hopkins, who took out a full-page, thank-you ad in the sports section of the Seattle Times, thanking the crowd after an earlier game. “I’ve been in a lot of arenas, and a lot of tough games . . . when the crowd stood, it was as loud as I’ve heard in any arena. Hopkins is entitled to go off the deep end, given where the 17-6 Huskies find themselves — third in the Pac-12. They play at Oregon Thursday (7 p.m., FS1) and at Oregon State Saturday (7 p.m. ESPNU). Big fun: Hopkins gets to deploy the genuine-article, low-post, back-to-the-basket big man on offense to go with his old-school, 2-3 zone defense. Short shorts and black canvas, Chuck Taylor high-tops for everyone. First Alcindorians…..that’s a 10 right there from every Olympic judge. Thanks for noticing. It’s starting to grow on me. These days, teams rarely list a C in the starting lineup. It’s often FFGGG. It’s almost as if coaches are ashamed to admit they have one. One of my biggest criticisms of Romar during the past 3 to 4 years was that he did not or would not run his offense through the post! He lived by the 3-point shot and he certainly has players that could shoot the 3. However, if you have NO post presence, and you do not run your offense thru the post you are going to DIE by the 3-point shot. Romar’s teams became very easy to defend with that type of strategy! Hopkins, obviously understands the value of running your offense through the post. ….and I might add if you look at the final four teams of the recent past you’ll find that they do the same. Almost no one does anymore. Ironically, the old school zone is perfect for defending this new offensive ethos. The soft spot of the zone is the top of the key, and for years the efficiency guys have been decrying that shot because low percentage 2’s are the new basketball anathema. What used to be a pretty standard shot for a big guy isn’t anymore because the mid-range jumper is going the way of the dodo. Guys don’t practice it anymore. A 7-footer with a good 15 foot shot won’t wow NBA scouts, but a 3 point shot will, and they’re very different shots. Offense is now all about penetration to the hoop through ball movement and the three pointer. Those are the things the zone takes away. It would be interesting to see what the NBA would be like if there wasn’t a defensive 3 second penalty, but people like offense, so the rules give it to them. Going back to the Sonics heyday, the thing that most scared opposing scouts about Shawn Kemp wasn’t his dunks or boards. It was his ability to hit the 15-foot jumper. But even he didn’t recognize the weapon, and kept driving to the hoop and picking up fouls. If he had relied on it steadily in the 96 Finals, Jordan would still be pouting about missing that title. If the Huskies make the NCAA tourney, they will run into teams capable of hitting the elbow J’s. But the Pac-12 teams can’t do it. Even whern Rustic and Ayton found those holes in the zone, they didn’t persist. Aye, in the 90’s all the good bigs had a mid-range game. When Karl Malone wasn’t getting a lay-in off the pick and roll, he’d do a reverse pivot to clear space and just shoot the 15 footer. Same with Barkley when he wasn’t dribble backing someone up. Ewing had it. Hakeem had it. Tim Duncan is probably the last guy where it’s a big part of his game. In my own average basketball career of high school and small college ball in the late 90’s/early 00’s, I played 4, and while I can kind of recognize what my role used to be in some college offenses, in the NBA, except for maybe with Deandre Jordan or Boogie, it’s gone, and neither of those guys have a mid range game. You have 7 footers playing what used to be 3. That said, except for the lack of Sonics, the new Warriors style of NBA ball is a lot more fun to watch than the 90’s slugfests. You’re right. But until Dickerson, he didn’t recruit a post player with the hands and feet necessary to do what you described. N’Diaye and others have been limited with the ball. Todd MacCulloch was the last low post guy who could shoot and pass. Well that was a train wreck tonight against the Ducks . Hopefully they bounce back Saturday against the Beavers ..
That court Oregon has is gawd-awful ! Really distracting as a fan to try and watch the game with that ..